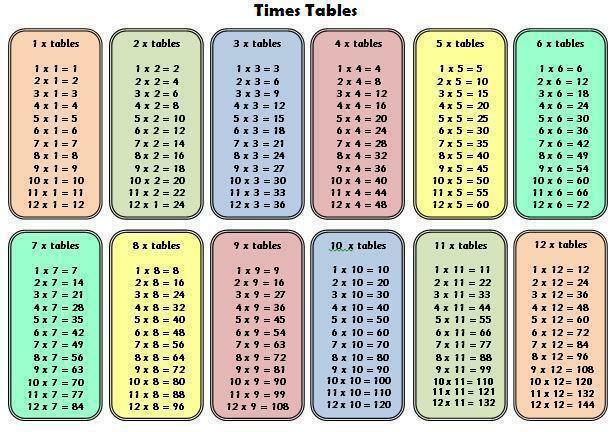 Learn these times tables by repeating them over and over, looking at them as you say them. Also look for the patterns and use the times tables you know to help you with those you don’t. Remember the 2x table helps with the 4x and 8x, and the 3x helps with the 6x and 12x tables. 1. Learn them so you can say them without stopping: 1x4=4, 2x4=8, 3x4=12, 4x4=16…. 2. Be able to answer questions out of order and in reverse: what is 5x3, what is 2x3, what is 3x8? 3. Be able to answer related division: what is 12÷6, what is 66÷6, what is 36÷6?